What are your thoughts on cranberry sauce? Do you hate it? Or do you like the log of cranberry sauce that comes out of a can, complete with the lines from the can completely intact? If fresh, homemade cranberry sauce is your Thanksgiving style, then this tutorial on how to make cranberry sauce is perfect for you! When I was growing up, my grandmother always made cranberry relish for Thanksgiving dinner. Fresh cranberries, whole oranges, and sugar, all ground up together. No cooking. I liked it okay but the bitterness of the orange pith made it a little much for my young tastebuds. We really never ate the cranberry sauce that came out of a can, and honestly, I can’t even remember when or where I first tried it. I do remember, though, that when I did try it, I realized that I had been missing out on the deliciousness that is cranberry sauce. And then I figured out how to make homemade cranberry sauce. I fell in love, hard, and realized that the canned stuff that you slice is just gateway cranberry sauce. I promise you, canned cranberry sauce in no way compares to homemade cranberry sauce. I love how the flavor of orange pairs with the flavor of cranberry, so I always use some orange juice and zest to give my homemade cranberry sauce a little zip. But, if you don’t like orange or have another reason not to use it in your sauce, then just leave it out! Click here to save this recipe to your Pinterest holiday cooking and sauce boards! I call myself a cranberry hoarder because the second that cranberries show up in my grocery store, I start throwing a bag or two into my cart every week so that I can have frozen cranberries available all year. That way, I can have homemade cranberry sauce anytime I want it. Which means that year-round I can make my Instant Pot turkey breast and some cranberry sauce and have a Thanksgiving sandwich whenever. I. Want it. And that, my friends, is a reason to be happy. This recipe is adapted from Smitten Kitchen , whose recipe is adapted from Ocean Spray . Combine all ingredients except orange zest, if using, in a medium saucepan. Set over medium heat. Cook, stirring frequently, until the sauce has thickened and all berries have burst. I use the spoon to gently mash the berries against the side of the pan to make sure they all burst. This takes 10-15 minutes total. Stir in the orange zest, if using. Place the sauce into a covered container or jar and refrigerate for at least 4 hours. It will keep in the refrigerator for up to two weeks or up to two months in the freezer. This easy Caesar dressing is easy to make in your blender or food processor and requires no eggs, so it lasts a long time. And it’s SO tasty! Scroll down for video. Essentially, Caesar salad came into my life when Philip Haymaker came into my life. Well, when he came into my life full-time, anyway (since we knew each other for four years before we started dating). I remember what he ordered on our first date: angel hair pasta with tomato-basil sauce and a Caesar salad. That was on a Tuesday night. We went out again on Friday…I don’t remember what entrée he ordered, but I remember this: he ordered a Caesar salad. And almost ever restaurant salad that he has ordered in the last fourteen and a half (!) years has been the same. I don’t mean to imply that I had never encountered (or eaten) a Caesar salad before that first date. I recall a Caesar salad at a Red Lobster in California when I was visiting my aunt the summer before eighth grade. I also remember telling my mom about it and her saying, “Do you like Caesar salad?” in a shocked sort of way. It’s just that my family didn’t eat too many Caesar salads back then….most of our salads were of the iceberg variety, with tomatoes and maybe some green peppers or avocado mixed in, usually with a creamy ranch or blue cheese dressing. It’s actually funny to think about that now because my mom and my sister are pretty much completely enamored with Caesar salad these days and the four of us threaten each other with steak knives to see who’s going to get the last of the salad (not really but almost). Caesar dressing is an enigma of sorts and there are all types of stories about what Caesar salad is supposed to be. You know what I say? Caesar salad is supposed to be good. I don’t think when Caesar Cardini threw together the first Caesar salad in his Tijuana hotel kitchen that he swore then and there under his breath to seek revenge on anyone that dared to change the recipe. So here’s how it goes…you can put eggs in….or leave them out. You can use anchovies, or maybe you prefer paste (I do) or maybe you’d rather just use Worcestershire sauce (which contains anchovies)? Okay. Maybe you like your cheese shredded, or maybe you like it grated. Whatevs. Do you like to rub the bowl with garlic or do you like to crush the garlic into your dressing? Have it your way. Would you rather make a pourable dressing or would you rather assemble the salad in the bowl then make the dressing right there on the lettuce (as I did in this post)? The world is your oyster. I’ve been doing it that way for a while: lettuce in the bowl, then egg yolks, garlic, cheese, lemon juice/vinegar, olive oil, and cheese plus croutons. I like it that way….but here’s what I don’t like: one-day salad. Make that one-hour salad. We all know that once you dress lettuce it’s done for….so I was happy when my aunt gave me her easy Caesar dressing recipe (which I used to have before the blog but lost). It doesn’t contain eggs so it’s got a relatively long shelf-life (I’ve kept it for up to four days in my fridge) and it emulsifies beautifully if you blend it just fast enough, and you just use what you need. As you can see, this is not a very “traditional” salad I’ve photographed for you here….I didn’t have bread to make croutons so I crushed up some Stacy’s Simply Naked pita chips. They were perfect. And while I prefer shredded cheese on my salads because it coats the leaves oh so perfectly, cheese (Grana Padano in this case but usually Parmigiano Reggiano) shaved with a vegetable peeler makes a nicer visual impact for photos. My easy Caesar dressing pairs perfectly with this fresh salad. This easy Caesar dressing is quick enough that you can keep it in the fridge all the time. Which you’ll want to do. Press the garlic through a garlic press or grate on a Microplane or fine grater. Place in a food processor or blender or a container you can fit your immersion blender into (like my homemade mayonnaise, a pint-sized Mason jar works well here) along with all of the other ingredients except the oil and vinegar. Mix well, carefully breaking up/mashing the anchovy fillets if you are using them. Add the oil and vinegar and blend on the highest speed that your machine allows until completely smooth and emulsified. Use a leaf of the lettuce you will be using to make your salad to taste; adjust seasonings. Store in the refrigerator. Shared on Meal Plan Monday on Southern Plate. This kale pesto with almonds is a quick and easy sauce that is great on pasta, breads, and sandwiches or mixed into vegetable dishes. Real talk: is there anything tastier than pesto? If there is, I haven’t found it yet. I remember when I first discovered it, back when Philip and I were first married. A friend at work was talking about it (her girls called pasta with pesto “green noodles”) and I decided that I needed to try it. Armed with my trusty Better Homes and Gardens Cookbook and a super cheap mini food processor that I bought from Target (seriously, some piece of plastic broke off of it every time I used it), I whipped up some amazing spinach pesto. Philip and I developed a serious pesto addiction. 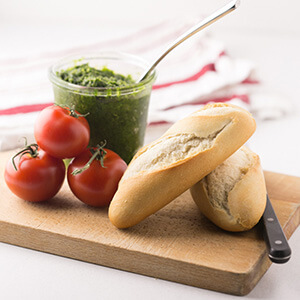 We don’t eat pesto quite as much these days as we did way back then (almost 16 years ago!) but I still love a good pesto. And homemade is always, always better than store-bought. And why not? It takes about 10 minutes to make, aside from the toasting of the nuts. Pesto is traditionally made with basil, but it takes a LOT of basil so I like to bulk it up with spinach. However, I had some kale that I bought at Earth Fare a couple of weeks ago and I really needed to use it up. Voilà: kale pesto. I have to say, it was fantastic. I made it with almonds instead of pine nuts, mostly because I didn’t have pine nuts but also because I recently read about something called pine mouth and I’m a little bit paranoid. It might be a minute before I am brave enough to eat pine nuts again. Kale pesto isn’t just for pasta, you guys. I mean, of course it’s perfect on pasta. It’s also amazing slathered on a sandwich (hello, rotisserie chicken & ciabatta???) or just on a hot baguette, mixed with cream cheese to dip a cracker into, stirred into a vegetable side dish, or even whisked into a vinaigrette. No matter what, kale pesto is absolutely fabulous! Shared on Meal Plan Monday on Southern Plate! Pulse the kale, basil, almonds, and Parmesan cheese in a food processor until finely ground. Scrape down the sides of the bowl with a spatula. With the food processor running, pour the olive oil very slowly through the food processor chute. Add salt and pepper to taste. Serve immediately or refrigerate for up to a week. If you need an appetizer that is special but OH SO EASY and versatile, baked brie with Jezebel sauce is perfect and has a little Southern flair! I recently did a kids’ cooking class where we made baked sesame chicken. It was delicious – panko crusted chunks of chicken thighs tossed in a sweet and sticky honey soy sauce. As I am typing this, I am wondering if I can find an excuse to make that for dinner tonight instead of the tacos I’m supposed to be taking pictures of. Thing about it, though…one of the kids wanted his chicken unsauced. And this kid, according to his mom, is not a picky eater. He just. doesn’t. like. sauce. What is that? Like, I cannot even begin to wrap my head around this concept. No sauce? Does not compute. I can remember dipping my chicken McNuggets into ketchup as a babe then later becoming 100% obsessed with creamy honey mustard and finding new things I could dip into it. This is why I have grown to love brie. Baked brie is the perfect vehicle for sauce…it goes just as well with sweet sauces as it does with savory. Need an appetizer? If you aren’t sure what to serve, pour some sauce over some baked brie and shazam. There you go. Whatcha gonna dip into it? Who cares!!! Crackers, vegetables, fruits…whatever you want. This baked brie with Jezebel sauce is where it’s at. Have you ever had Jezebel sauce? With pineapple preserves, apple jelly, whole grain mustard, and horseradish, it’s sweet and a little bit tangy, and it’s great in so many applications. Can you imagine dipping fried chicken into this? Or maybe drizzling it on a sandwich (oh, wait, I’ve got that one covered – stay tuned for that later this week)? It’s absolutely fabulous, and served over baked brie it just POPS. 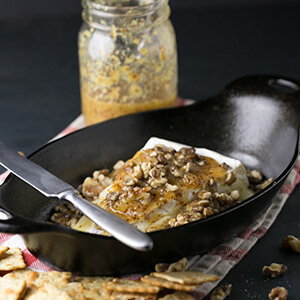 Serve this baked brie with Jezebel sauce the next time you need a great appetizer – you’ll be glad you did! Shared on Meal Plan Monday on Southern Bite! Preheat the oven to 350º. Place the brie in a small baking pan. Place it in the oven for 8 minutes. While the brie is baking, whisk together Jezebel sauce ingredients in a medium bowl. Remove the brie from the oven and pour the brie over. Place the walnuts on the side so that they will toast. Place the pan bake into the oven for 7 more minutes. Remove the brie from the oven and serve immediately with crackers, crostini, vegetables, or fruit. I like to bake this in a dish/pan that is nice enough to serve it in. This honey BBQ bacon cheeseburger is perfectly pan-fried in cast iron and topped with bacon and creamy bbq sauce. It’s hard to beat! Summer won’t start officially for another few weeks now, but everyone knows that Memorial Day weekend is the unofficial start to summer. School’s out and, here in the South at least, it definitely feels like summer. 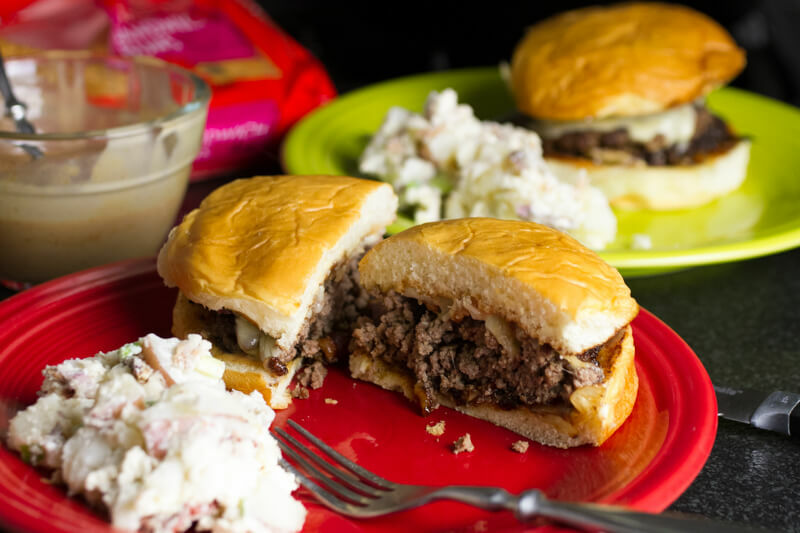 Summer is cookout season, and I can’t even imagine how many burgers will be grilled over the next three months or so. 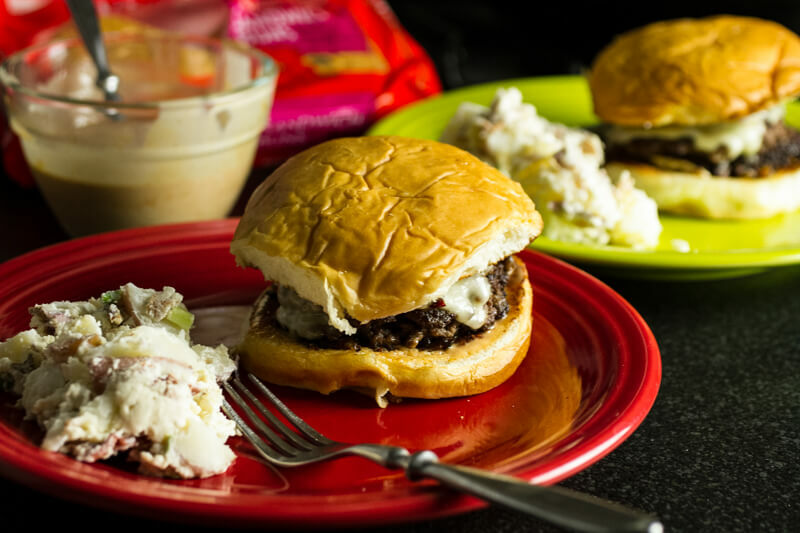 Everyone who reads this blog regularly knows that burgers are kind of my “thing”. I’ve made lots of burgers over the years, and while they were edible, the perfect burger has eluded me. I’ve been eating a lot of burgers lately in preparation for updating my top burgers list, and with a more strategic approach to choosing my favorites I’ve learned a few things about just what makes the “perfect” burger. I always thought that grilled burgers were the pinnacle of burger perfection, until I discovered that this was not the case. That’s right…this bacon cheeseburger here does not bode well for your summer cookouts. The best burgers? Pan fried over high heat. Preferably in a cast iron skillet. My 12-inch Lodge skillet is just perfect for that. I made them thin (double patties = greater surface area = more crispy bits = yaaaaaasssss) and cooked them hot till they were crusty on the outside and juicy on the inside. The meat has to be just right. I like to grind my own, and I’ve found that a blend of skirt steak and boneless short ribs provide just the right fat content and texture for my liking (by the way, you can grind your meat in a food processor if you don’t have a grinder-I use a KitchenAid attachment). If grinding your own meat isn’t your thing, buy 80/20 meat at the store…this is not the time to worry about fat content…especially considering what I’m about to tell you. I add butter to my burgers. Yep, butter. The extra fat amps up the flavor. I also season the meat before forming the burgers so you can taste the seasoning throughout. Another thing-the perfect burger (in my house, anyway) always has cheese-melted cheese. You have to find a good melting cheese, and in this case, a good quality American cheese (i.e. not the kind that is individually wrapped in plastic) is perfect for melting and doesn’t distract from the flavor of the burger. Sometimes, a strong cheese is a good thing, and I do love a good Cheddar, Gruyere, blue, or Gouda. But it must.be.melted. I have also discovered that minimal toppings make the best burger. I’ve done something I never thought I’d do and started requesting my burgers without lettuce and tomato. I love lettuce and tomato (and kind of feel like a picky toddler when I ask for them to be left off) but often I think they cause a breakdown in “structural integrity”-i.e. how well the burger holds together. 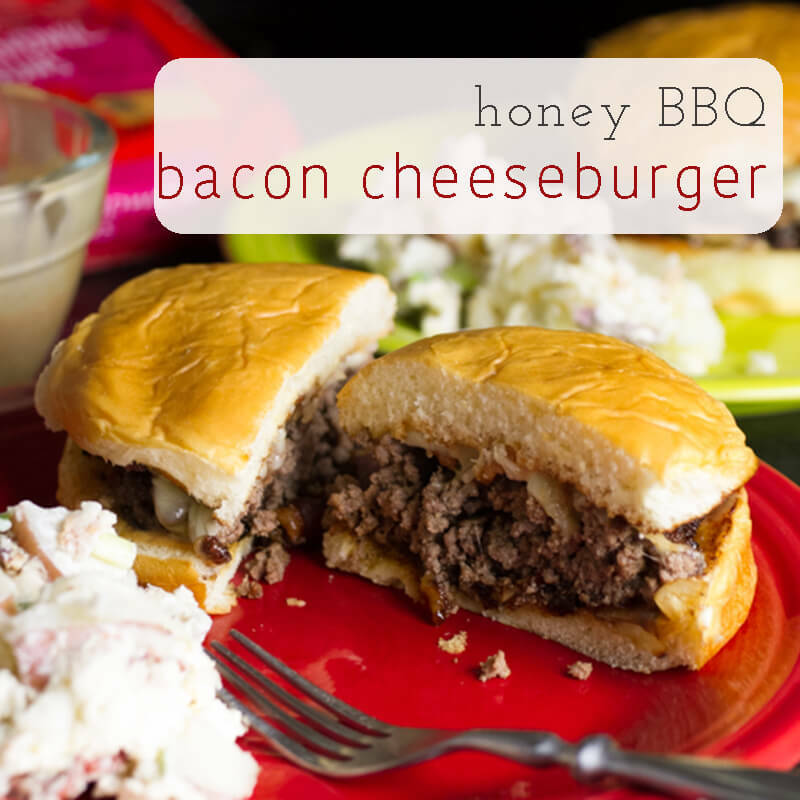 In this case, a creamy honey BBQ sauce (which is really just my Chick-Fil-A sauce copycat recipe), caramelized onions, and bacon (crumbled and tucked under the melted cheese) work together for a pretty heavenly bbq bacon cheeseburger. A soft bun is paramount…I like Martin’s potato rolls (which I buy at Publix) most of the time, but for this sweet and savory burgerI used a King’s Hawaiian bun. The bun should be sturdy enough to hold up to the toppings (you don’t want your burger to fall apart halfway through like one I ate in a restaurant a couple of months back) but soft enough to not cause you to choke when you try to swallow. And now…I never have to leave my house for the perfect bbq bacon cheeseburger (but I will anyway). To make the sauce, whisk all the ingredients together in a small bowl. Refrigerate until ready to serve. Cut the skirt steak and short ribs into large chunks. Freeze for 15 minutes. 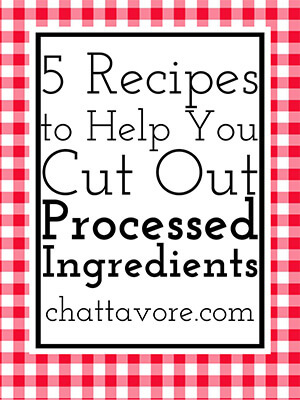 Grind using a meat grinder or in batches in a food processor. Melt one tablespoon of the butter. Spread the ground meat onto a sheet pan and sprinkle evenly with the melted butter, 1 teaspoon of the salt, and the pepper. Divide the meat into 4 piles then divide each pile into 2 smaller piles. 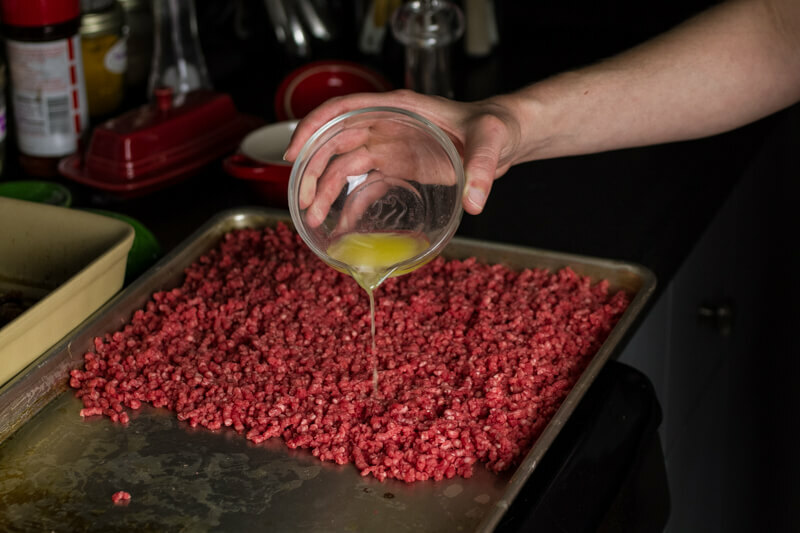 Carefully pack each pile of meat into a ball then press into a thin patty. BE CAREFUL NOT TO OVERWORK THE MEAT! I would rather have a slightly "loose" patty than overwork it and have a tough patty! 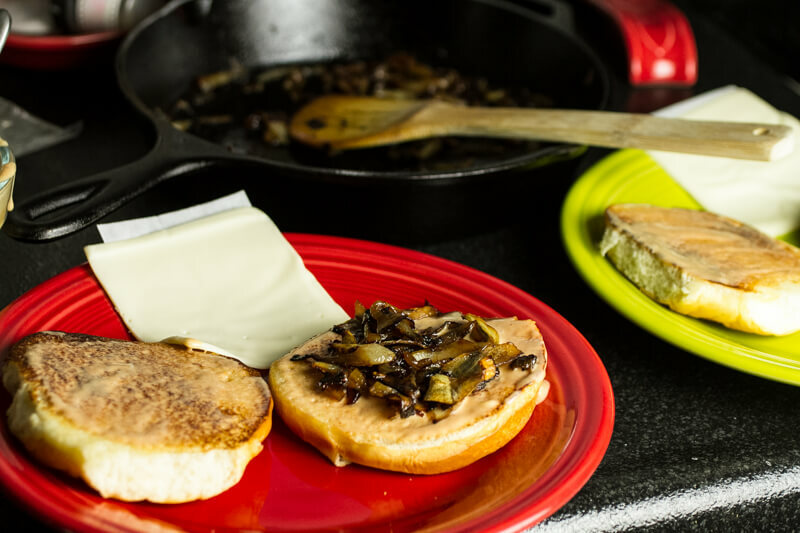 Melt 1/2 tablespoon of butter in a 12-inch skillet over medium heat. Split two buns and brown the insides. Remove to a plate and repeat with the other two buns. Heat 1/2 teaspoon of the oil in the 12-inch skillet (cast iron is my favorite) over high heat. 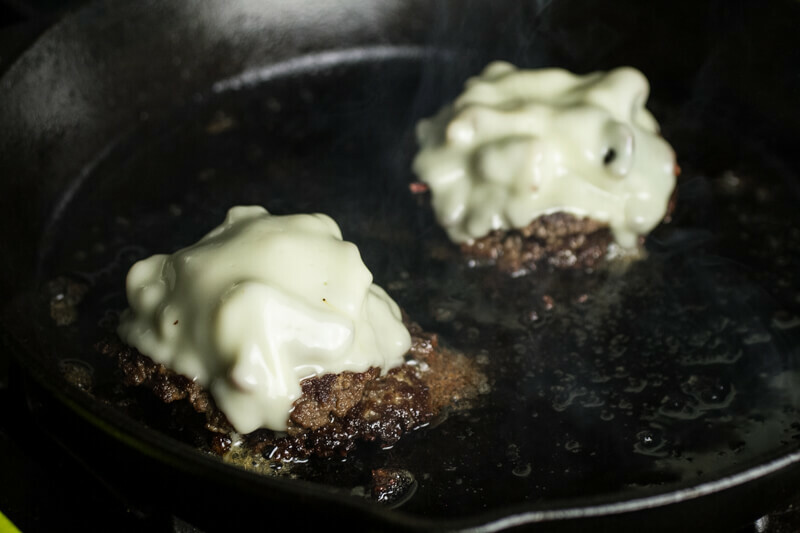 Place four patties in the pan and cook for 2 minutes on each side. Make two stacks and top each with a crumbled slice of bacon and a slice of cheese or an ounce of grated cheese. Cover the pan and cook until the cheese has melted. 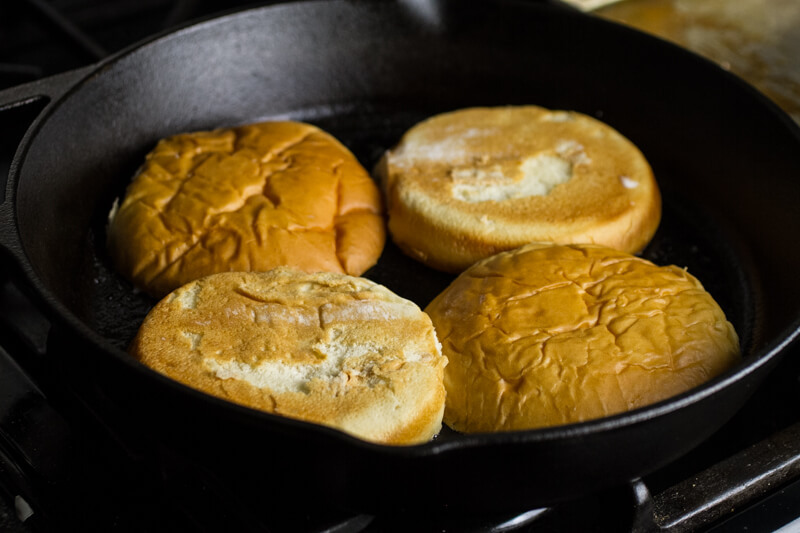 Remove from the pan and repeat the process with the four remaining patties. Open each bun and spread the top and bottom bun with a thin layer of the barbecue sauce. Top each burger with caramelized onions or a couple of onion rings, if using. Place the top bun and serve immediately. If you prefer not to grind your own meat, use 1 1/2 pounds 80/20 ground beef.